What Else Can I Expect From an Online Bachelor's in Animation Program? Animators are needed to help create digital games and applications. According to the Bureau of Labor Statistics, the field of multimedia art and animation is projected to grow by 6%, and the median salary for an animator is $65,300 per year — almost double the national average. Earning your animation degree online is an investment in your future. The program prepares you for a dynamic career that allows you to use your creative and digital arts skills. Below is a list of online animation programs and their specifications, which includes coursework, program length, and future careers. Online animation degree programs can vary by curriculum and program length, but many have common courses that focus on digital media design. Students enrolled in online computer animation degree programs can expect to engage in courses that cover web design, graphic imaging, and 3D modeling. Graduates are prepared for careers as multimedia artists, web designers, and art directors. Many online digital art programs offer a bachelor's degree in digital media design with concentrations in animation, 3D modeling, and media technology. This allows students to follow career or personal interests. These concentrations all have specific curriculum and software training requirements. Online digital art degrees also differ between capstone requirements, which may include a portfolio or field work. A portfolio requires student to compile the work they've completed throughout the program and present it to a faculty panel. Field requirements are similar to internships and require students to apply their learned skills in a real-world setting. Students need to consider which is more valuable to their careers. It's important to find a program that will help you reach your goals and that will fit your schedule. Southern New Hampshire University, located in Manchester, offers one of the more popular online animation degree programs available: a bachelor’s in graphic design with a concentration in 3D modeling and animation. This animation degree online program utilizes software such as the Adobe Creative Suite and Autodesk, which teach students the essential skills for careers in game development, digital animation, and web development. Courses include history of design, advanced digital imaging, and desktop publishing. SNHU offers more than 200 online programs and provides financial aid opportunities, including a 30% tuition discount for active-duty service members and their spouses. Students in this 120-credit online digital art degree must provide their own hardware and software that meet a minimum standard, which includes a laptop with at least 16GBs of memory, a digital SLR camera, and the Adobe Creative Cloud. Some student discounts are available on these products. National University has 28 locations across the U.S. and more than 90 graduate and undergraduate online programs. The school's bachelor of arts in digital media design consists of 180 credits, and at least 45 credits must be completed on campus in La Jolla, California. The remaining credits can be completed online, where students take career-oriented courses on topics such as video game design, applied web design, and media storytelling. All animation degree online classes are taught asynchronously, which allows students to start and finish courses on a timeline that fits their schedule. National's animation degree online strengthens student's working knowledge of software applications that are utilized within positions in the field of gaming, video, and digital graphics. Graduates are prepared for careers as art directors, web designers, video editors, and project managers. Baker College's digital art degree online program has a business-oriented approach. The bachelor of digital media technology in digital media design teaches students how to apply graphic design and web development skills in a business setting. Students learn a mixture of technical and creative techniques relevant to careers that involve advertising, sales, and web design. Courses include digital marketing, personal selling, graphic presentation, and world wide web design. The courses in this animation degree can be completed entirely online and are offered asynchronously, giving students the opportunity to start and finish assignments whenever it fits their schedule. Learners who live near one of the 14 Michigan locations can choose to take the program in a hybrid format. Students must complete the general education requirements and an online orientation course. The school is accredited by the Higher Learning Commission and offers one of the best online animation degree programs. 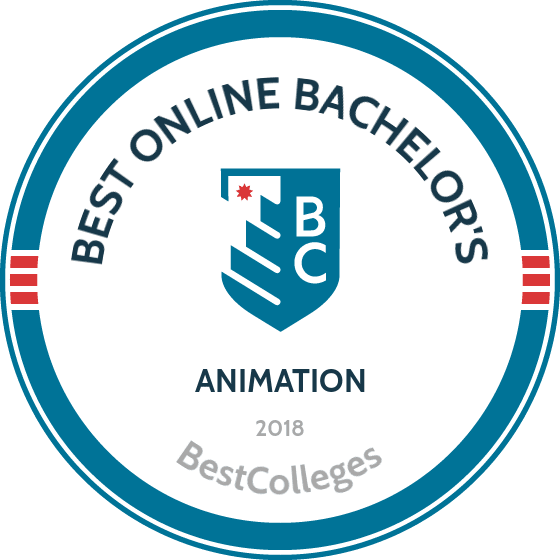 Many online animation degree programs offer curriculum and program timelines that are designed to work around your current commitments and future career goals. Programs often have courses that focus on strengthening digital design and software skills, but specific program components may vary depending on the school and program chosen. Each online digital art degree has different course offerings, requirements, and concentrations, but most programs will cover similar content that's relevant to careers in animation. Below is a sampling of common courses found in animation curriculums. Web Design: Students look at the elements of website architecture and effective website design. Learners apply their knowledge of graphic design to the world of digital media. This class provides preparation for future careers as web producers and content strategists. 3D Design and Modeling: This course is relevant to students who want to pursue a career as a video game designer. It has students produce 3D elements in digital, animated sequence, video, and print media formats. Students in 3D design and modeling classes learn to create 3D designs that are still and in motion. Desktop Publishing: Many online digital art degree programs have courses that introduce software applications such as Adobe InDesign. Desktop publishing teaches foundational software and design skills that are relevant to many animation careers. Graphic Imaging: This course teaches students how to take and transform photographs for web and print mediums. Students learn how to adjust, repair, and retouch images. The content in graphic imaging courses is relevant to students looking to pursue careers as digital media artists and website designers. HOW LONG DOES IT TAKE TO GET AN ONLINE BACHELOR'S IN ANIMATION? The length of an online bachelor's degree in animation depends on several factors: whether students take courses synchronously or asynchronously, in-person requirements, whether certain degree concentrations require more credits than others, and how many credits are needed to graduate. On-campus requirements will vary by program. It takes about 180 credits, or four years, to graduate with an online computer animation degree. Another factor that may influence program length is whether it's taught in an independent or cohort format. Independent formats are taught asynchronously, and you can usually choose to take heavier or lighter course loads. Cohort programs require students to take courses at the same pace as their peers and usually take longer to complete. This format provides a more traditional, on-campus feel. It's important to make sure that any college program is accredited. Accreditation shows that schools have met educational standards set by a board, organization, or government. Regional accreditation is most common. The Commission on Colleges of the Southern Association of Colleges and Schools, New England Association of Schools and Colleges, and the Higher Learning Commission are a few of the regional organizations that use specific standards set by the U.S. Department of Education (ED) to grant accreditation. Students looking into earning their digital art degree online should also make sure that their program is accredited by the National Association of Schools of Art and Design (NASAD). NASAD is composed of 360 accredited institutions that uphold national standards for art and design programs. The association also provides a database of accredited schools that meet their educational standards. The schools with the best animation degree online programs should appear in this database. The U.S. Department of Education and the Council for Higher Education Accreditation (CHEA) also provide databases which provide lists of accredited school. Both of these groups recognize legitimate agencies that accredit institutions and programs. Using the databases provided by NASAD, the ED, and CHEA is a reliable way to make sure online learning programs meet educational standards. An online degree in animation prepares students for a range of careers. Earning your undergraduate degree in the digital arts makes you more valuable to potential employers. The degree proves that you have the necessary technical and artistic skills and a portfolio of work. Below is a table of common jobs in animation along with the median salary for each job. The majority of the higher paying jobs require a minimum of a bachelor's degree. While job placement in the field of digital arts increases by earning a bachelor's degree, it is also important to note that job opportunities and salary trends vary greatly depending on location. The highest paying animation jobs are located on the east and west coast. The next table features data from the Bureau of Labor Statistics regarding the top-five paying U.S. states for multimedia artists and animators. Most jobs in the digital arts field involve the use of technology, so it's important that staring at a computer screen everyday is not an issue. Having a strong knowledge of software applications, such as the Adobe Creative Cloud, is also an essential prerequisite for most jobs in the field. An animation degree online program will prepare you to thrive in the careers listed below and others. This career is for decision-makers with creative outlooks. Art directors are responsible for the visual appearance of online and print materials such as magazines, product packaging, and movies. A bachelor's degree and several years of graphic design work experience are usually the minimum requirements for most art director positions. This technical occupation uses various programming languages to write and test code which allow computer applications and software programs to function properly. A bachelor's degree is required for most computer programming jobs, but some employers hire associate degree holders. A formal education is typically not needed for craft and fine artists. Those who do earn a bachelor's or master's degree often do so to improve their skills and job prospects. Graphic designers create the layout and design for various print and digital materials such as advertisements, packaging, and websites. A bachelor's degree and a portfolio of work is typically required to find work in this position. Web developers are responsible for the creation and design of websites. Their job responsibilities often include improving and maintaining a website's content, appearance, and performance. The minimum education level needed to become a web developer is an associate degree, but web developers with a bachelor's degree will have more job opportunities and higher salaries. Current students and graduates of animation degree online programs can tap into tap into a wealth of resources through professional organizations. The face-to-face interactions with industry professionals at networking events and conferences are a gateway to future jobs. These organizations also often list career opportunities related to the field of digital media, providing invaluable connections to help you jumpstart your career. AIGA, one of the oldest and largest professional membership organizations for design, represents more than 20,000 design professionals, educators, and students. The organization has different levels of membership that vary by cost and associated benefit. This education-focused organization works to increase awareness of professional standards and best practices in the graphic design field. Ico-D provides a platform for professionals, educators, and students to network and collaborate on design ideas and education opportunities. The International Game Developers Association is a nonprofit organization for game developers that has chapters on multiple continents. Members have the opportunity to attend video game developer conferences and learn new skills through online and in-person seminars. To cut down on the costs of higher education, students should utilize numerous financial resources such as scholarships, loans, grants, and fellowships. The FAFSA helps students understand what resources are available to fund their online digital arts degree. Depending on the school, online students can also take advantage of discounted tuition rates for remote learning. Most arts-related scholarships are offered through a university's arts department to students who demonstrate need and/or academic excellence, so check with your academic adviser for funding opportunities within your major's department.